Everyone knows that the best parties are the ones where the cocktails come with monkeys on them -- now you can party hearty with your very own cocktail monkey bag! Knit from the bottom up on double point needles, the natural hemp twine gives it that jungle-y look that monkeys love. 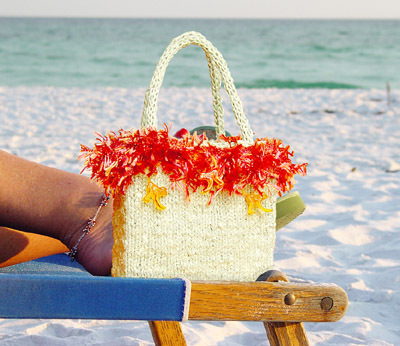 Although the hemp is stiffer than standard yarn, it is quite workable and provides a sturdy framework for the bag. The festive tropical fringe and the monkeys add that special je ne sais quoi -- could it be that the cocktail monkeys know that they are the life of the party? CO 15 sts onto one double-pointed needle. Work in st st until work measures 6 inches in length. This piece will form the base of the bag. Pick up and k 23 sts along first long edge of piece using a second double-pointed needle, pick up and k 15 sts along next (short) edge of piece using a third double-pointed needle, pick up and k 23 stitches along rem long edge of piece using a fourth double-pointed needle. 76 sts. Working in the round, k every round until work measures 6 inches from edge of base. BO all sts. 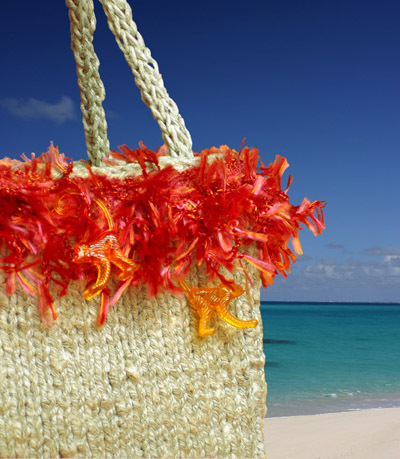 Place bag in washing machine without detergent, and run machine on warm setting for a short wash cycle. It is crucial to use a washing machine for this step- the hemp cord will leach yellow liquid that the wash cycle rinses out. Do not dry bag -- it is now ready for blocking. 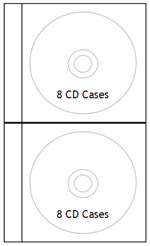 Using CD cases, make two stacks, each with 8 cases. Place stacks next to each other, with wide edges of stacks touching. Wrap the two piles of CDs together with plastic wrap. You will have a rectangular block that measures 5.25 x 3.25 x 9.75 inches. This is what you will use to block your bag. Slide damp bag over cds, adjusting so that the hem is straight. Place in warm well ventilated area to dry. CO 4 stitches onto one double-pointed needle, leaving a 12 inch tail. The tail will be used for sewing the handle to the bag. K these sts onto another double-pointed needle. Next Row: Slide 4 stitches just worked to other end of needle, bring yarn around back of work (pull taut but not tight enough to make knitting difficult) and k these 4 stitches again. Repeat this row until cord is approximately 11 inches long. Give cord a firm tug every few rows to pull the stitches into place. Once cord is desired length, break yarn leaving a 12-inch tail, draw yarn through all sts on needle, and pull tightly. Make a second handle in the same manner as the first. 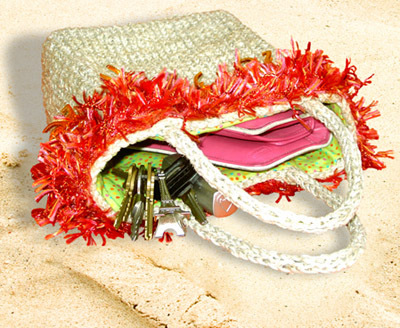 Once bag is completely dry, use yarn tail at each end of i-cord to attach handles to bag. Pin each handle end about 1 inch down from top of bag and 1 inch in from side of bag and secure by sewing first the end, and then each side of the i-cord into place. Weave in ends. On paper, measure and cut out a square measuring 6.75 x 6.75 inches, and a rectangle measuring 4.25 x 6.75 inches. Using these as pattern pieces, cut two squares and three rectangles from lining fabric. With right sides together and leaving a half-inch seam allowance, sew long edge of one rectangle to edge of one square, as shown below. Sew second square to opposite side of rectangle. Sew short edges of remaining two rectangles to each end of bottom rectangle, and sew long edges of these two rectanlges to edges of adjacent squares. Press seams flat, so that seam allowances are open. Fold top of lining one half inch to wrong side and press. Insert lining into bag, and stitch into place around top using sewing thread. With needle and thread, stitch fringe into place around top of bag, folding over ends to prevent fraying. Stitch approximately 12 monkeys into place by sewing into a knitted stitch and then around top of monkey's tail several times. Place one every two inches or so, stitching some closer to top of bag and some slightly further down- that way the monkeys can make faces at each other! 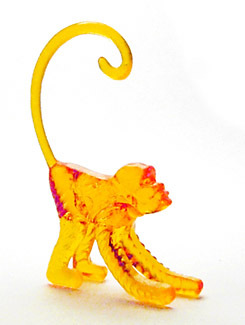 *You can make leftover monkeys into super funky stitch markers: dip their tails into a mug of boiling water long enough that they become pliable, and then use tweezers to grab the end of the tail and bend it into a ring. As a child, Kristin Goedert spent much of her time making stuff, from hats for soft-boiled eggs to sock monkeys, doll clothes to pot holders. Now that she is a grown up (or so they say) she puts her creative talents to good use as a graphic designer and owner of Kristin Goedert Design Kristin lives in the San Francisco Bay area with her husband and cats and spends as much of her free time as she can knitting, spinning, and drinking cocktails with monkeys on them.